Anthony Joshua’s U.S debut against Jarrell “Big Baby” Miller has been thrown into doubt after Miller tested positive for a banned substance. Matchroom Promotions supremo Eddie Hearn took to social media and announced that he had been informed by VADA of the positive test. The test, taken on March 20th from a random urine sample, has come back positive with a substance called GW1516 which is a banned performance enhancing substance. ESPN broke the news, with Miller’s co-promoter Dmitry Salita saying he awaits further information and Miller is still in training for his June 1st fight. 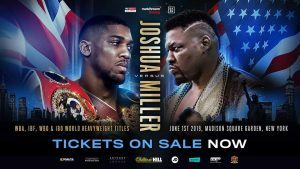 Miller (23-0-1, 20 KOs) had been reported to earn around $4.5 million for his fight against champion Anthony Joshua, it would appear his chance has been blown with the NYSAC unlikely to sanction the bout at Madison Square Gardens. A negative B sample and supporting evidence would be required for any chance of the fight going ahead. If the bout is cancelled, as seems likely, its unclear who will step in to face Joshua. According to Eddie Hearn, Joshua will be fighting on June 1st. The obvious choice would have been Dillian Whyte however he has turned down an offer to face Joshua at Wembley Stadium in April, unhappy with the terms of the deal so it would appear unlikely he would travel to the U.S to take on Joshua. Joshua’s IBF mandatory challenger, Kubrat Pulev, has recently been suspended by the Californian State Athletic Commision after kissing a female reporter after their post fight interview. His disciplinary is scheduled for May 18th. A more likely candidate could be Michael Hunter (16-1, 11 KOs), the former Olylmpic champion has only lost once against Oleksandr Usyk as a cruiserweight. Since moving to heavyweight he has won the vacant WBA International Heavyweight Title by beating Alexander Ustinov by TKO last November. Hunter seems to be interested.